BMPRO by Setec, innovators of the well-known ‘BatteryCheck’ App, have announced the release of a new Australian-made product that is exclusive to Jayco Caravan. 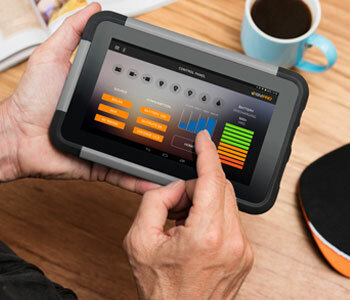 The new product, the JHub System, is an app-driven, Bluetooth-connected power management system that controls the on-board features of a Jayco caravan or motorhome, such as lights, the van’s slide-out, hot water and water pumps, while also managing incoming power, battery charging, tank levels, all from a tether-free Android tablet. BMPRO’s JHub System features an integrated solar regulator and distribution board on the J35 charging unit for up to 450-watts of solar panels. It also offers a ‘futureproof’ support with app updates available via Jayco or at one’s favourite app store, as well as a constant wireless communication (via the ControlNode101) between the tablet (which can be used for surfing the web) and the caravan battery management system. “Jayco is highly respected within the Australian Caravan industry for leading with innovation and delivering the best value-for- money to their customers. So when we worked with them to build something that would dramatically improve their customers’ adventures, we were ecstatic that it evolved into the JHub System”, said Setec & BMPRO CEO Louise Bayliss. “Now Jayco customers will be treated to the most intuitive experience in managing their on-board features and data with a cutting-edge, hi-tech product that we couldn’t be more proud of”, Ms Bayliss concluded. A standard feature on Jayco’s new off-road ‘Adventurer’ range and available on their motorhomes and Silverline vans, the technology for BMPRO’s JHub System was designed and manufactured in Knoxfield by Victoria-based Setec, a partner of Jayco’s since 2005, supplying their Drifter & ST Series power management solutions since 2013.